Applying topical probiotic products can help keep your skin in a balanced, healthy state. Not only can probiotics strengthen your skin’s barrier and shield it from harmful environmental factors, but they can also improve its ability to retain moisture and help prevent flare-ups. Rosacea, acne, and dryness are just a few of the skin-related problems that can be mitigated by probiotic skin care. In recent years, awareness has been growing around the key role probiotics play in digestive health. Now, more and more research is emerging to support the notion that these friendly little bacteria are beneficial for your skin as well. Your skin is host to millions of bacteria, some “good” and some “bad.” Keeping these living organisms in balance is crucial to keeping your skin healthy. Environmental factors can threaten that balance, causing the bad bacteria to exceed the good. That’s when the problems begin: acne, rosacea, eczema, and other complications can arise when that imbalance negatively impacts the normal functioning of your skin barrier functions and your body’s immune response. But it’s not just environmental conditions that wreak havoc on good bacteria. Even harsh soaps can strip that bacteria away, making your skin more vulnerable to inflammation, dryness, and other irritation. Enter: probiotic skin care. How can probiotic skin care improve your complexion? And which probiotic products are most effective, according to what your skin needs? This article shows how probiotics can be beneficial for a range of different skin types, backed up by insights from leading dermatologists. Probiotics can strengthen and rebuild the skin’s natural barrier, which keeps irritants out. Those with sensitive skin may find that probiotics help their skin to more quickly repair itself after damage. Moreover, probiotics can enhance the skin’s ability to deal with pollution, free radicals, UV rays, and other external elements that have the potential to cause harm. 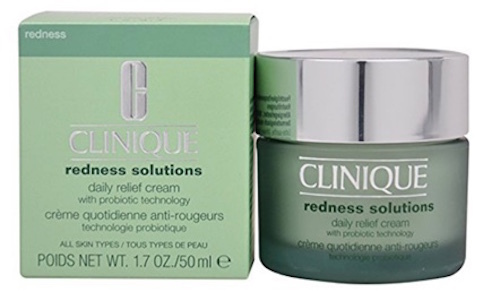 Clinique’s extra gentle Redness Solutions Daily Relief Cream is formulated with a soothing probiotic that can reduce redness and blotchiness, even redness from broken capillaries. When tested on participants with rosacea, they saw an immediate 33% improvement in visible redness. If you suffer from a skin condition like eczema or chronic inflammation, probiotic skin treatments can help to protect your skin against the harmful microorganisms that trigger immune reactions and cause flare-ups. Recent research published by the American Academy of Dermatology revealed that for those with rosacea, the immune system treats living microorganisms on the skin as foreign bodies. As a result, the immune system automatically fights these potential threats, causing redness and inflammation. But probiotic products can stop skin cells from releasing inflammatory mediators. In other words, probiotics calm inflammation and therefore reduce redness. Scientists have been exploring the “gut-skin-brain axis” since the 1930s. This theory describes how stress and anxiety wreak havoc on the microbiome of the gut, causing “bad” bacteria to outnumber friendly probiotic bacteria. This can damage the lining of the gut, leaking toxins into the body and causing inflammation. Research has shown that cells of the gut, brain and skin are linked by common embryonic origin. According to Dr. Kenneth Mark, a board-certified cosmetic dermatologist and Mohs skin cancer surgeon, this opens the way for new approaches to common skin concerns. 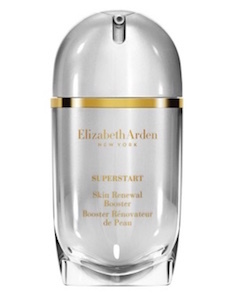 The probiotics in Elizabeth Arden Superstart Skin Renewal Booster are designed to boost the skin’s natural ability to renew itself. In fact, 92% of users reported that it helped repair both the feel and look of their damaged or irritated skin. Ceramides are lipids naturally found in the skin which play a crucial role in enabling the skin’s barrier and its ability to retain moisture. A deficiency of these lipids in the outer layer of the skin, which is known as the stratum corneum, has been linked to atopic dry skin. One study showed that women who applied a cream containing probiotics for just two weeks experienced a significant increase in ceramide levels, and their skin was notably more hydrated. 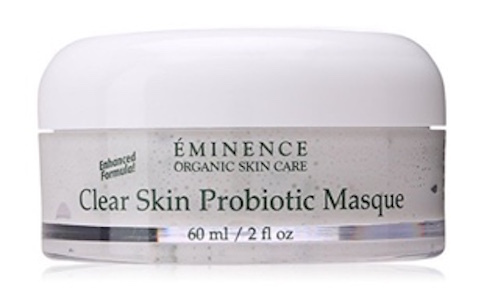 There’s a reason why Éminence Organic Skin Care Clear Skin Probiotic Masque has become so popular: with a blend of calming cucumber, nourishing shea butter, and exfoliating lactic acid, it’s a great option for those seeking a dewy, smooth complexion. 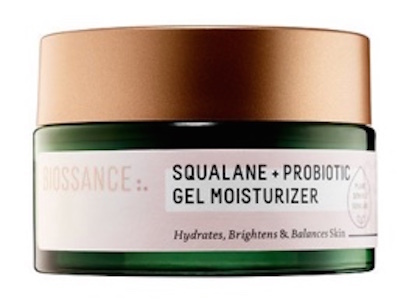 Alternatively, the ultra-lightweight Biossance Squalene + Probiotic Gel Moisturizer contains not just probiotics but also squalane, a natural, plant-based moisturizing agent that keeps skin feeling hydrated and looking radiant. You may already know that pollution and other free radicals in the environment can speed up the aging process by damaging elastin and collagen. Fortunately, applying topical probiotics can improve the skin’s natural defense against these aggressors while also repairing the damage they cause. Probiotics can also help the skin to retain moisture (and wrinkles are less visible when your skin is well hydrated). Probiotics can also help to ward off the premature signs of aging by shielding your skin against damaging UV rays. Tula Skincare’s Hydrating Day and Night Cream With Probiotic Technology locks in moisture and promotes skin elasticity with a powerful combination of probiotics, antioxidants, and a number of natural extracts. Moreover, it contains retinol to minimize the appearance of wrinkles and fine lines and to improve your skin’s overall tone and texture. If it seems like you’ve tried everything to treat your acne, to no avail, you may want to consider probiotic skin care. A recent study found that topical probiotics containing the bacteria Lactobacillus plantarum not only reduced erythema (patchy redness) but also reduced the size of acne lesions while also boosting the skin’s natural barrier. Dr. Jody Levine says, “On a case-by-case basis, I may suggest probiotic skincare to patients with acne, as probiotic treatment can reduce sebum and minimize pimples, and also to patients with rosacea or eczema, to help calm and soothe inflamed skin and strengthen its barrier.” She adds that, for patients who have undergone laser resurfacing treatments, probiotic skincare can also help accelerate the skin’s healing. Probiotics can also have an antimicrobial effect, killing that bacteria that lead to acne flare-ups, so consider washing your face daily with a probiotic-infused product. The Foreo Silicone Cleaning Spray, for example, can cleanse the skin without stripping it of “good” bacteria, thus maintaining balance and promoting a clear complexion.